Improve your team's scoring ability with skill development, breakdowns and transition drills from some of the nation's elite coaches. Get perimeter player drills for learning to play off penetration, enhancing court vision, and attacking off dribble hand-offs and ball screens. 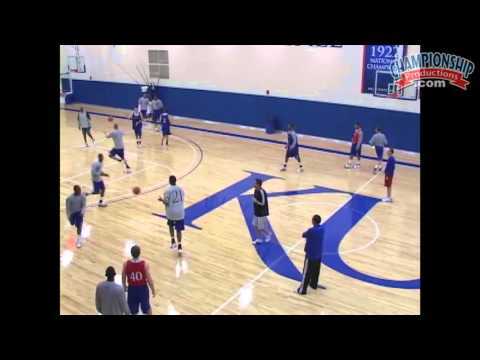 Utilizing both half-court and full-court drills to develop both the "read" and "react" elements of offensive execution, the video involves all-access coverage by 12 iconic coaches pushing their teams through 25 drills. Discover 14 half-court drills aimed at developing situational understanding and learning how to play the game the right way. Dribble hand-offs/back-door reads, surveying the court on the catch, communication, perimeter players playing off of a post, perimeter drive-n-kicks, and executing the wing screen-and-roll are on display as players must recognize the situation, read the defense (where applicable), and make the correct play. 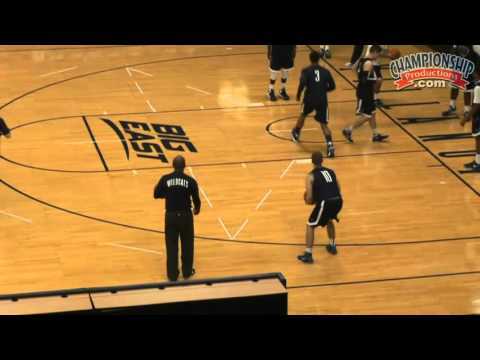 Geno Auriemma (3v3 DHO to Shake Option) - Players learn different actions based on the way the defense plays, as well as proper spacing for best results. Sean Miller (3 Around 1) - In this half court drill, the post player continuously works on getting open and guards work on diving to the rim, catching and shooting, or making the extra pass to an open shooter. Mark Few (Ball Swings 3-on-0, 3-on-0 Post Entry and Ball Screen Breakdowns) - Learn how to get your perimeter players to pass, maintain spacing, and play off dribble penetration. Coach Few also works on scoring options from side ball screens. Steve Prohm (Kansas Shots and Hammer Pass to Rover Screen) - Two drills that focus on getting shots in the ball screen offense. Bigs work on duck-ins and guards work on attacking the basket off ball screens. Ben Jacobson (Feeding the Post) - Using the Elbow Screen off the ball to feed the post and work off of the post in order to create offensive spacing. Jay Wright (Catch and Shoot, Ball Screen and 2-Ball Shooting with Low Cross Screen) - Coach Wright's drills emphasize footwork and reading the situation. Guards work to catch and shoot or to attack the basket using different finishes. The Ball Screen series works on attacking the basket from the wing. In the Jab and Swing series, guards practice setting up defenders to attack off of ball screens. In the Aces and Switch drills, forwards will set ball screens before rolling into post ups or popping for the perimeter jump shot. In 2-Ball Shooting, players use movements to get shots in places where they will shoot from during the game. Gary Waters (Guard Shooting and Contest Shooting) - Shooting drills that gives your players a lot of reps in a short amount of time. Don Showalter (Partner Passing Drills) - A passing series to build your players' weak hand passing skills. Eleven full-court, transition drills to instill a run-and-gun, attacking mentality into your team. Communication, hitting the outlet player on the run, passing ahead, finishing at the rim, and lobs to the "bigs" are on display. Mike Krzyzewski (3-man Passing, 415-drill , and 3-on-0 Catch and Face) - Coach K provides three drills that have helped him become the winningest coach in NCAA D1 men's basketball history. BasketballCoach.com presents: 25 Practice Drills for Offense 4.50 out of 5 based on 2 ratings. 2 user reviews.